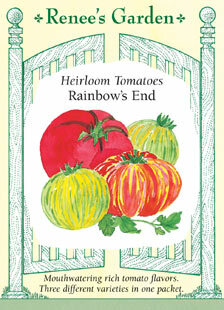 Pick up Renee’s Garden Seeds at Farmers Coop and get your spring garden started. Whether you’re starting your seedlings indoors this winter or planting straight in the ground, these certified non-GMO seeds from the Renee’s Garden will fit your needs. Renee’s Garden offers a variety of seeds for use in home gardeners, based on great flavor, easy culture and exceptional garden performance. The seed line includes new, exciting and unusual seed choices of time-tested heirlooms, certified organic seeds, the best international hybrids and fine open-pollinated varieties. These varieties are tested and guaranteed for every major US climate zone. Whether you plant our Certified Organic seeds or choose from our large range of conventionally produced seed varieties, you should know that supporting sustainable farming practices is an integral part of Renee’s Garden. They have signed the “Safe Seed Pledge” developed by The Council for Responsible Genetics; we do not sell chemically treated or genetically engineered seeds. Pick up Renee’s Garden Seeds at your local Farmers Coop. Please note that inventory and selection vary from store to store. Please call your local Farmers Coop to confirm availability. Farmers Coop has 17 locations in Oklahoma, River Valley, and NW Arkansas ready to serve you. This entry was posted on Thursday, December 15th, 2016 at 11:13 pm	and is filed under Garden, News & Updates. You can follow any responses to this entry through the RSS 2.0 feed. Both comments and pings are currently closed.